Create a sustainable future for your family! Increasing concerns of climate change coupled with federal & local tax incentives have made solar homes a reality. Installing solar panels on your home reduces your carbon imprint the equivalent of planting 88 trees per year. Plus, you'll save an average of $84 per month on your electricity bill. 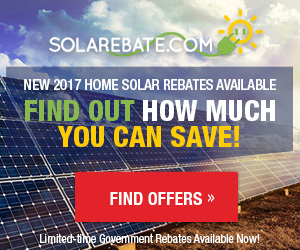 Find out about new 2017 home solar rebates available by clicking over to the Solar Rebate website today.